Two Years takes its premise from the perennial religious argument that the universe is controlled by the whims of god(s) rather than by immutable natural laws. Where does this lead? 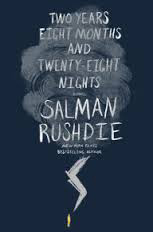 There are an almost infinite number of answers to that question, but the one Rushdie gives us is a world controlled by mischievous jinn (genies), some good, some bad. The book’s two central characters are Dunia, a well intentioned female jinn who’s in love with a medieval liberal muslim philosopher, Ibn Rushd (whose family is known as the Rushdi), and a modern-day gardener, Geronimo Manezes, who’s a descendant of Rushd and Dunia. The secondary characters are mostly other jinn, good and evil, and other descendants of Dunia and Rushd, who like Geronimo, have latent supernatural powers. Along the way, there are numerous references to writers and artists, including Conrad, Bunuel, Magritte, Beckett, and many others. These references are great fun when you catch them, but irritating when you can’t think of whom they refer to; there’s also quite a bit of dry humor in the book. Lest this sound too sappy, Rushdie concludes the book with a twist in the final paragraph, a twist that induces both a wry smile and a shudder. Zeke Teflon is the author of Free Radicals: A Novel of Utopia and Dystopia. He’s currently working on the sequel.